Transparency Market Research has released a new market study on marine composites. The report, titled “Marine Composites Market - Global Industry Analysis, Size, Share, Growth, Trends and Forecast, 2013 - 2019”, projects the global marine composites market will display an impressive 7.0% CAGR from 2013 to 2019. If the figure holds true, the market will be worth US$1,549.6 mn by 2019, increasing from its market valuation of US$954.6 mn in 2012. The report states that increasing manufacture of leisure boats, combined with technological advancements, is driving the global marine composites market. In Asia Pacific, in recent years, the development of new boat building industries in China, South Korea, and other Oceanic countries has been a major reason for the substantial demand for marine composites. Despite strong demand for marine composites in Asia Pacific, stringent environmental regulations in Europe pertaining to styrene concentration will impede the global marine composites market. 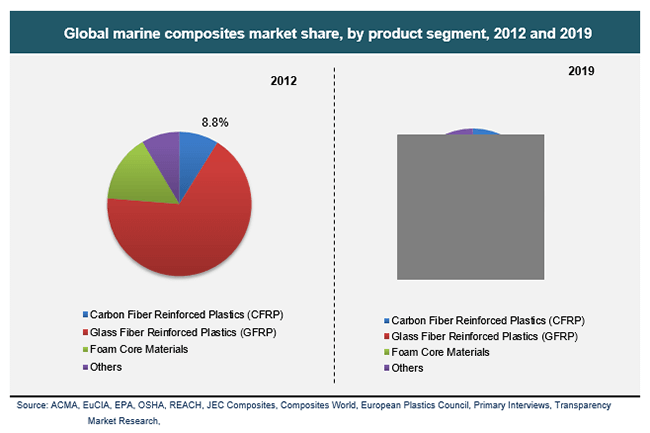 However, increasing demand for bioplastic-based boats and positive expansion scope for the prepegs market will provide significant opportunities for the industry to capitalize on, say TMR analysts.The report divides the global marine composites market on the basis of products, end users, and applications. By products, glass fiber reinforced plastics (GFRPs) registered the highest demand and contributed maximum revenue to the global market in 2012. This is because GFRPs are light in weight and available at an affordable price. These attributes contributed to the increasing demand for GFRPs in the global market. In addition, a steadfast demand for GFRPs from the powerboats and private watercrafts sectors added opportunities for the product segment. Foam core material was registered as the second largest product segment of the global marine composites market in the same year. The product segment is expected to account for a larger market share in the global market for marine composites in the forthcoming years.Other marine composite product segments such as metal composites and out-of-autoclave prepegs will emerge as dominant segments in the global marine composites market in the years to come. By geography, in 2012, North America dominated the global market for marine composites. In the same year, Europe stood as the second largest market for marine composites, due to an upswing in demand for personal watercrafts and small boats. Between 2013 and 2019, the Asia Pacific marine composites market is expected to expand considerably. This is mainly due to the development of boat building industries in China and Rest of the World. The Rest of the World region is expected to exhibit unwavering demand for marine composites in the forecast period. The report provides a detailed competitive outlook of the global marine composites market, with market share analysis and company profiles of key players in this market. Cytec Industries Inc., Toray Industries Inc., Hexcel Corporation, Koninklijke Ten Cate nv, Taijin Ltd., E.I. du Pont de Nemours, 3A Composites GmbH, Gurit Holding AG, and Zoltek Companies Inc. are some of the major companies operating in the global marine composites market.